Chances are extremely good that you probably have never heard of VBLs (Vapor Barrier Liners) or if you have are unsure how they function or can work to improve your winter outdoor experiences. Mountaineers have known for years about the benefits of VBLs but for the average sportsman they are relatively unfamiliar. This is due to the superior performance of VBLs at high altitude and on winter excursion measured in weeks rather than days, two scenarios rarely encountered by the “average” sportsman. In fact, VBLs may be one of the most misunderstood pieces of equipment in the cold fighting arsenal. If you constantly battle with cold toes then VBL are a great solution and I encourage you to read on. VBLs are basically a thin layer of plastic that can be worn directly on your foot OR more typically on top of a thin synthetic liner sock (no cotton!). The liner sock is then covered with your heavy weight wool or synthetic sock and the works are stuffed into your boots. The logic behind VBLs is that they lock in the moisture generated by your foot and don’t allow it to seep into your heavy insulating sock and boot liners. This is extremely beneficial, if you have feet that produce sweat by the bucketful! An added benefit is that your feet will actually stop perspiring when the area around your skin reaches 100% humidity. Something about osmosis, diffusion, semi-permeable membranes or some other scientific blather that frankly makes my head ache. Many sources will explain that VBLs will not necessarily make your feet “warmer” but instead will make them “drier”. However, a dry sock will keep you toastier longer as its loft will be maintained. For this reason, I add approximately +5 degrees F to the insulation rating of any boot system incorporating VBLs. For those looking to try VBLs I suggest that before you jump on the internet and order a pair for $30 bucks that you try an experiment to see if you like the VBL system. VBLs are certainly not for everyone and some love em and some hate em. For the LOVERS they embrace all of the components mentioned above, dry feet and toasty toes. For the HATERS they complain about damp liner socks and feet that slide around in their boots worse than an Olympic slalom skier. First visit your sock drawer and find a pair of thin SYNTHETIC dress sock. Put then on your feet and next get your hands on the wife’s oven roasting bags (chicken) or plastic bread bags and slide them on. Lastly, pull out your smart wool expedition weight socks and put them on as well. Throw the entire works into your favorite ice fishing or hunting boot and head out onto the hardwater or into the woods and see how it works! For those of you brave enough to try my little experiment it would be great to receive a comment. An explanation of your experience (length of time out, temperature, etc.) would be great BUT for those short on time a quick response of LOVER or HATER would be more than sufficient! Thanks! 35 years ago my mother would send us out with our feet wrapped in plastic bread bags. It kept your feet warmer and dryer. She never referred to it as the vbl system, I think she called it the wonder bread system. If their feet are warm and dry they will stay out longer!! I’m enjoying your Blog very much! I found it through my friend Albert at The Rasch Outdoor Chronicles™; he seems to find all the best blogs on the internet. I’ll be reading your posts as the weeks continue. I don't get out as often as I used to, but I sure would like to give that a try; warm feet make for a good day afield. Scott, Mine used to do the same thing before sending out on the mudflats in our sneakers to dig clams! Those damn bread bags would last about 3 minutes before they would tear and get our sneakers all muddy!! Bob S, Thanks! Nothing kills a good day in the woods or on the waters like cold feet. It always the first thing I warn new sportsmen about! Take care of your feet and they will take care of you!! With this post and some further research, I will apply the basis of your post at West Grand for our fishing trip. I'm a bit skeptical but also a bit encouraged for it does make sense. When I think of 100% humidity, I think of moisture. I'm thinking my feet may be pickled after your test. I was also going to contribute the bread bag story as well but it has been pretty well documented in the comments..nothing left to say about it except I will lift up my glass in a toast to Moms!! We don't get enough snow and cold weather to try this out. 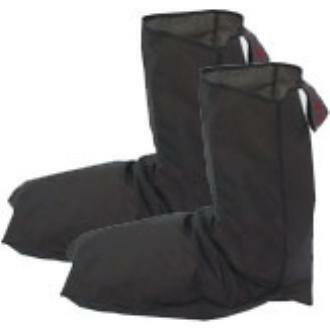 When we do get some snow...I have my trusty MUCK boots.